If you’re an 80s/90s-cusp kid like me, you may remember the infamous Arsenio Hall catchphrase, “Things that make you go hmmmm.” Well, I have a good one for you today, Mr. Hall: coffee flour. Say what? Yes, we can now add coffee flour to the long list of wonderful things to do with the coffee bean! So, here’s the scoop. Coffee beans grow cozy as a bug in a fruit called a “coffee cherry.” After harvest, the edible fruit is usually thrown out, but some companies are now drying the cherries and grinding them into an environmentally sustainable soft flour. Developed by Dan Belliveau and Andrew Fedak, it made its debut at the TED2015 Conference in Canada and is now produced on three continents—in Nicaragua, Guatemala, Mexico, Papua New Guinea, and Vietnam. According to coffeeflour.com, it doesn’t taste like coffee, but rather has more floral, citrus, and roasted fruit flavors. That's why it’s such an interesting ingredient in things like breads, cookies, muffins, bars, brownies, pastas, sauces, beverages, and so much more. Coffee flour has several positive characteristics when compared to other flours. For example, Paleo-approved flours are made from milled nuts and seeds and are therefore high in fat. Almond flour has about 3.5 grams of fat per tablespoon, whereas coconut flour has 1 gram per tablespoon. Coffee flour, on the other hand, has only 0.056 grams per tablespoon. Although high fat foods have a place in Paleo diets, it’s beneficial to have a wheat-free, low-fat flour alternative. One tablespoon of coffee flour also contains 310 mg of potassium. That’s twice the amount of one cup of brewed coffee, and a little less than one banana, which comes in at about 450 mg. Potassium is an essential mineral associated with lower blood pressure, reduced risk of stroke, protection against loss of muscle mass, and preservation of bone mineral density. More good news: one tablespoon has 5 to 6 grams of fiber (about five times more than whole-wheat flour), plus antioxidants. You’ll have to do some taste testing with your baking. Consumer Reports reported their cookies revealed some bitterness. Others have reported variable results with cakes and cookies. But brownies have been good to go with no taste difference. Yum! The catch is: you still must use mostly regular flour. Consumer Reports suggests limiting coffee flour to 15-25% of the total. I got excited over their suggestion to add a tablespoon to your morning smoothie, though, for the same amount of caffeine as a 6-ounce cup of joe. 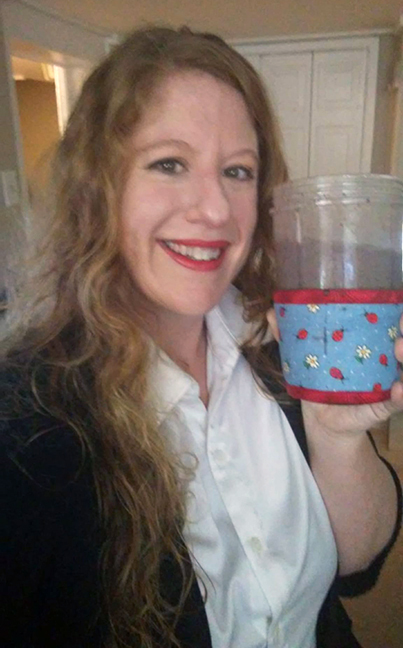 I’ve already gotten breakfast down to all my servings of fruits, veggies, and protein in one easy-and-fast-to-make blender cup – now you’re telling me I can get my caffeine in there, too? Right on! Don’t forget to add a Kream Kollar™ to your NutriBullet (above) to keep your smoothies cold throughout your morning rush or a Kup Kollar™ cup sleeve to your breakfast smoothie at home (below). These are things that make you go Mmmmm! Have you tried coffee flour? Let us know what you thought in the comments!